DEAR JERRY: A very popular record in northeastern Minnesota in the early 1960s is "My Mind's Made Up," by the Renowns. I think it might have even been No. 1 in the Duluth-Hibbing market. In the years since, I have never heard this or anything else by the Renowns. Any idea how it was received or how successful it was elsewhere? DEAR KEN: When released in January 1961, the first, and as best we can tell the last, record by the Renowns met with great enthusiasm in your area because the band hailed from Hibbing. "My Mind's Made Up," backed with "Wild One" (not the 1960 Bobby Rydell hit), is a split of sorts. The A-side features a Wanda Jacksonesque Marjorie Lake, while Andrew Nash handles the vocal on "Wild One" (Everest 19396). In their January 30th issue, Billboard gave Lake's "My Mind's Made Up" a Special Merit Spotlight and a four-star (i.e., "Strong Sales Potential") review: "[Marjorie] sells this swinging rocker with a lot of spirit, with a wild [guitar] backing." Inexplicably, one of the best records of its day never appeared on any of the national charts. No wonder this has become a $75 to $100 single. Oh yeah, in January 1961, Robert Allen Zimmerman — born in Duluth and raised in Hibbing — left Minnesota for New York City to embark on an amazing career as Bob Dylan. DEAR JERRY: Here is a faded '60s memory that I hope you can restore. Every Friday afternoon, one of the St. Louis stations, possibly KWK, unveiled the Top 10 tunes for the new week. I recall once when nine of the Top 10 were either all or in part by females, and they made a big deal out of it. I think the only male that week was Roy Orbison, if that helps. DEAR MARIA: Those few years leading up to the 1964 British Invasion were the summit of the girl group era. Soon, even the two top ladies of the decade, Connie Francis and Brenda Lee, could no longer count on virtually every one of their singles becoming a hit. It may surprise you to rediscover that the man in that week's Top 10 was Andy Williams, with "Can't Get Used to Losing You." For four consecutive weeks that spring, Andy held the No. 2 position, topped first by the Chiffons (two weeks), then Little Peggy March (two weeks). In late March and early April, Roy Orbison was in the Top 10 with "In Dreams," but he and the other men (Bobby Darin, Cascades, and Bill Pursell) dropped out when the women moved up in the rankings. On the national level, Jackie Wilson's "Baby Workout" was in the Top 10 in March and April, but you recall there being just one male in the local countdown, so that would point more to Andy than Jackie. Mixed-gender groups such as the 5th Dimension and Edwin Hawkins Singers do not include a woman's name, and are not counted in this search. By far, the worst year for the gals in the Top 10 is 1969. It was dreadful. For nearly all of the first quarter we had the usual mix of artists in the Top 10, with only one week (March 1) when it was all males. Then, from March 29 through August 8 (19 weeks), no qualifying female acts made it. The shutout ended briefly from August 9 through September 19, while Jackie DeShannon's "Put a Little Love in Your Heart" shuffled around between No. 9 and No. 4. 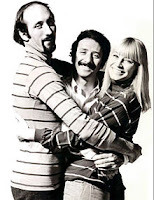 When DeShannon departed, the feminine famine resumed for another 10 weeks, September 20 through November 28, when Peter, Paul and Mary's "Leaving on a Jet Plane" ended the drought. The astonishing summation of 1969 is that no women's names appear in 30 of the 52 Top 10 lists.